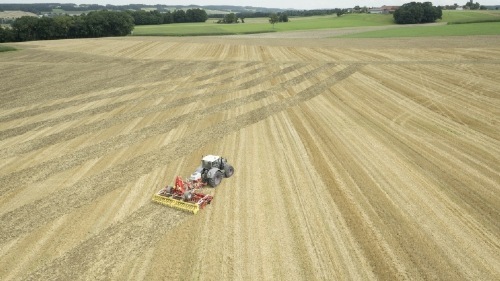 The MULTILINE system brings together a compact disc harrow or stubble cultivator with a seed drill. The result is cost-effective, extremely high-performance mulch drilling technology that enables sensational flexibility during operation. Used solo or in a combination, the MULTILINE concept promises enormous potential for lower horsepower tractors. 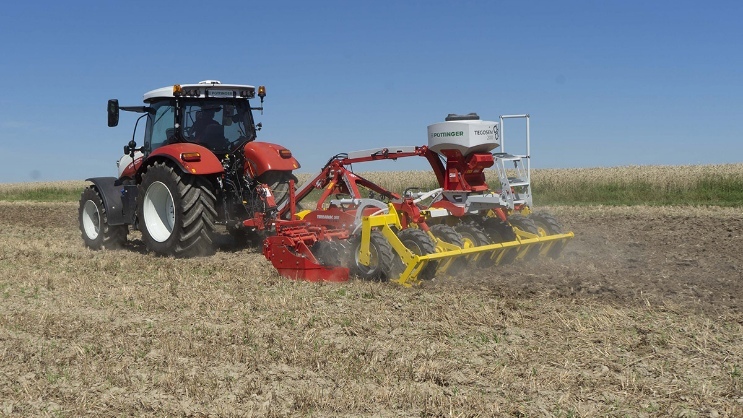 For the first time, the MULTILINE system is now available with the TEGOSEM cover crop sowing unit. 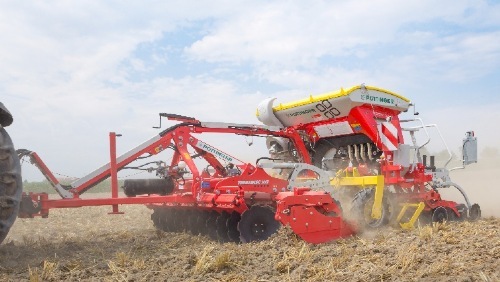 This allows the MULTILINE system to be used solo, or together with a TEGOSEM cover crop unit, or as a mulch seed drill combination with a VITASEM mechanical drill or AEROSEM pneumatic drill. The TERRADISC MULTILINE is available in working widths of 3 and 4 metres. The basic unit is a TERRADISC compact disc harrow, or a SYNKRO stubble cultivator, in both cases in combination with the new tyre packer. The machine is trailed using a drawbar attached to Cat. III / width 2 low linkages. 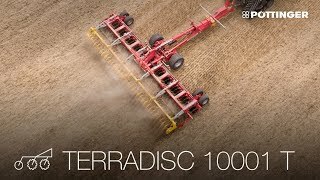 The TERRADISC MULTILINE and SYNKRO MULTILINE concept gives the user a wide range of combination possibilities, exceeding the demands of the market. The Pöttinger TEGOSEM can be used to drill a wide spectrum of seed material, from mustard to grass and rapeseed through to peas and beans. The metering system is driven electrically. Two different metering shafts ensure precision distribution, even at very low seed flow rates. The seed material is distributed pneumatically using distribution plates. This ensures precision regardless of the wind conditions. Calibration is easy: the calibration procedure is started by pressing a button located conveniently on the machine. 20 seconds is all it takes to calibrate the seed drill to the required seed rate. A calibration bag is provided as standard equipment. The TEGOSEM is fitted as standard with an intuitive control terminal that regulates and monitors the metering shaft and sets the seed flow rate electronically. The metering shaft is controlled electronically independently of driving speed and adjustment from the tractor cab is infinitely variable. The control terminal also has a kg/ha display, a priming function, a headland management system, a tank emptying function, automatic calibration and counters for total hours, hours per day, total hectares and hectares per day. The level indicator for monitoring the contents of the seed hopper, a DGPS ground speed sensor, sensors on the top link and chassis for starting and stopping metering, plus the loading platform, are what make the TEGOSEM stand out. Two metering shafts (fine and coarse) that can be interchanged without the need for tools complete the offering. The technical requirement for using the TEGOSEM is a 3-pin socket (for controlling all models, and for the fan motor on models with a working width of 3 and 4 metres).